SOME local businessowners are nearing the end of the tether as the final two weekends of road closures in Andersonstown to facilitate the Belfast Rapid Transit system approach. The roadworks, which are set to continue this Sunday, May 27 and finish the following week on Sunday June 3, have been blamed for a drastic drop in Sunday trading turnover for many businesses in the hospitality and services trade on the busiest day of the week. Little Plate proprietor Paul Hesketh told the Andersonstown News that his business had only done between “20 to 25 per cent of what we usually do on a Sunday”. Paul said that the BRT works have had such a negative impact that he doesn’t envisage his business opening much longer “after the summer”. 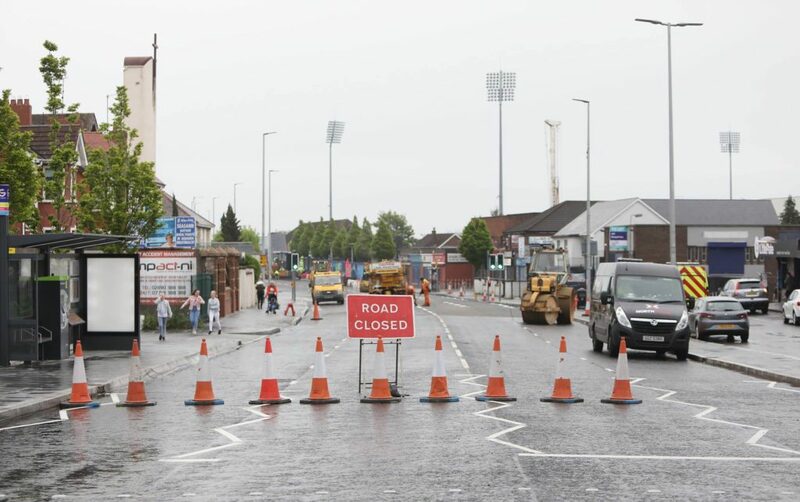 Paul said that the roadworks will look great once they are completed but that businesses on the Andersonstown News are not “equipped” to deal with the knock-on effects of BRT which is set to launch in September. Paul said the damage to his business “had been done” and that he while he believed in the concept of his business he had no option but to now look for other premises. Manager of Morelli’s at Temple ice-cream parlour Danielle McCann said their takings had also taken a massive hit. “We are only a year into our new venture at the Busy Bee complex and we were extremely quiet Sunday past,” she said. “Sunday is usually the busiest day of the week for us as you have many families, young people out on the road, and we really cannot afford to be getting hit like this. Motorist Christina Sloan contacted the newsdesk to say how “chaotic” the Andersonstown Road was as she tried to pick up her 14-year-old daughter from local dance group Kolliizon. West Belfast MP Paul Maskey said he had spoken to many businesses in the area who have “struggled to keep their doors open” since BRT works got under way. “There is no doubt that there has been major disruption throughout West Belfast with the roaworks,” he said. “Businesses have suffered and there has been a loss of business for many. We have raised this with DfI [Department for Infra-structura] and Belfast City Council. The department have stated that the roadworks are coming to an end soon and I think we will all be in a better place when the works are completed. We always lobbied the department to keep to a minimum the disruption but as we all know that was not always the case. We have asked the department and the council to look at incentives for businesses in the time ahead to maximise the return for them when all works are completed. I hope that we all can get our weight behind the local businesses and support them in the time ahead. It’s important that we support those who create employment opportunities and services for local people over many years and I have no doubt they will continue with the first class service they provide for many years.